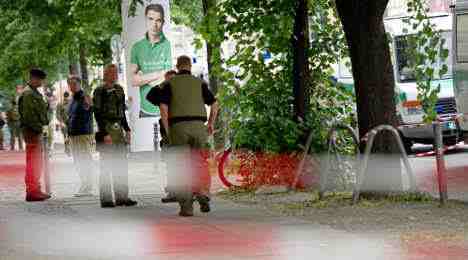 A BOMB has injured a number of police after they repeatedly charged into an anti-austerity demonstration in Berlin. Reports Earth Times: "An attack which wounded two riot police officers during an anti-government demonstration in Berlin employed a homemade bomb stuffed with shrapnel, German police said on Sunday. "The blast seriously wounded the two and caused minor injuries to 13 other police at the leftist rally Saturday against Chancellor Angela Merkel's austerity and welfare-cutting plans. "It had not been disclosed on Saturday that a bomb was involved. A police spokesman said the device had apparently been packed with nails or broken glass or something similar. "The wounded police were in improving condition, the spokesman said. Three demonstrators were arrested on suspicion of throwing the bomb, but were freed on bail during the night. Organizers claimed 20,000 people attended the anti-capitalist rally. "Reported a post on UK Indymedia: "The Greek protest wave has finally hit Germany. Scuffles broke out this Saturday in two major German cities after riot police attacked protest marchers. "50.000 angry trade unionists, leftists and anarchists had taken to the streets against chancellor Merkel's social cuts package. The cuts are being touted as Germany's biggest austerity drive since World War Two. "In order to stem the crisis in the EU and save the single currency Merkel's government wants to cut 30 billion euros ($36.11 billion) over the next four years in welfare, mainly from unemployment benefits, and axe thousands of federal government jobs. "In Berlin riot police repeatedly charged into the protest march, and in Stuttgart a party leader of the socialdemcratic SPD had to be saved by police from angry protesters. As he tried to deliver a speech at the rally hundreds of marchers shouted the politician dówn and pelted him with bottles, sticks, eggs and bananas. "The two rallies on Saturday are to be followed by a serious of protests in smaller towns in the next weeks, and a European day of action is to follow soon."